A delightful blend of bush & beach, nestled amongst the gum trees of Lorne's forested backdrop, yet only 3 minutes drive to the Great Ocean Road. Magnificent beaches, cosmopolitan restaurants and Lorne's bustling shopping village. Fourty-three acres of private bushland, provides plenty of space for families to kick a ball around, or have a game of cricket or volleyball. The added temptation of a yabby dam, (try barbecuing yabbies with lemon & garlic or dipping in sweet chilli sauce), an adventure ropes playground and a 15 minute circuit walk down into the valley, ensure families have plenty to do. Birdseed is provided for the cheeky king parrots & cockatoos and kangaroos are often seen grazing outside your door. Got a question or would like some more info? Just visit our contact us page and fill out our enquiry form! Why wait to book your accommodation when you can do it right now! 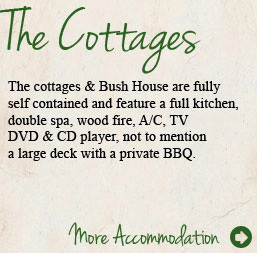 Simply follow the instructions on our online booking facility to get your next holiday underway!